Roth Pump Company offers a variety of steam condensate pump return stations for improving the operation and efficiency of heating systems. In most heating systems, condensate, and sometimes steam, is trapped out of heaters, kettles, hot presses, molds, absorbers, and other equipment and drained to a return unit having given up some of its heat in the process. If a trap malfunctions, the condensate can be passed to the return unit at a much higher temperature causing the return unit to fail. When using Roth steam condensate pump return stations as the return unit, this problem is overcome because they are designed to eliminate cavitation at higher temperatures. In addition Roth steam condensate pump return stations are designed to handle the higher load placed on it during a cold start. Roth steam condensate pump return stations eliminate boiler system problems and continue to provide the efficient return of hot condensate to the boiler or feedwater system. Roth steam condensate pump return stations are supplied with reliable pumps that are designed to handle hotter water and develop higher pressures at lower speeds. Roth steam condensate pump return stations are ideal for remote or non-accessible locations where unattended, dependable performance is essential. Roth Pump offers a variety of condensate return stations ranging from small efficient units to large, high temperature units for the most demanding applications. Increasing the condensate returned offers a high rate of return on your plants energy efficiency. 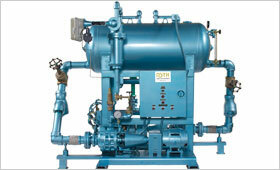 Roth Steam Condensate Pump Return Stations can be supplied for either simplex or duplex operation. Simplex units, ordered with larger receivers, can be converted to duplex operation in the field if an upgrade is required. Users can specify either cast iron or 3/16 inch (4.8 mm) steel receivers with receiver capacities ranging from 8 to 350 gallons (30 to 1325 liters). A safety reserve is provided in these capacities to handle water at up to 10psi (0.68 bar) above the selected discharge pressure. Safety venting to the atmosphere is standard. Electrical equipment is generally mounted at least 1 foot (0.305 M) above floor level for safety and to maintain pumping if flooding occurs. 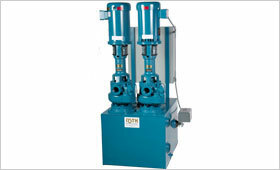 Roth units are supplied with an internal pump that operates at 1750 RPM. 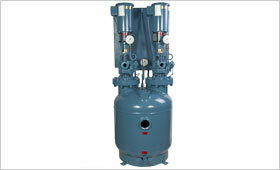 Pumps are leak proof and easy to maintain. Floats are set at the factory to provide about 2 inches (5.08 cm) of water level variation between start and stop. This insures frequent recycling and smaller condensate transfers at higher temperatures, thus improving overall efficiency of the boiler system. If condensate is pumped directly to the boiler, this feature provides a more continuous flow. 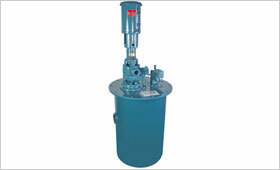 provided with optional pressure gauges for the pump discharge. An optional thermometer can be provided for the receiver. Motor sizes range from 1/4 HP to 15 HP and operate at 1750 RPM. Operating voltages are 115/230 volt single phase or 230/460 volt three phase. Enclosed motors are available as an option. 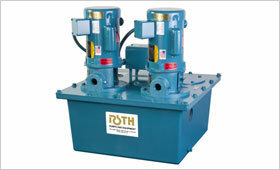 Optional electrical equipment supplied with Roth Transfer Stations include starters, switches and/or alternators. All electrical equipment has been selected from electrical suppliers that have wide distribution and field service networks. 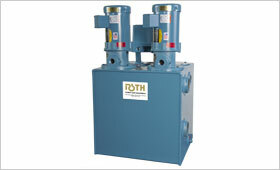 Roth Pump Company is a U.L. Listed manufacturer of control panels. Underwriters Laboratories Listed Industrial Control Panels are available on request..